Though the series was started by newly formed studio Infinity Ward in 2003, publisher Activision started recruiting other developers to make entries into the franchise. After a legal dispute drove the crew that made Infinity Ward great out of the company, Treyarch, developer of the Black Ops series has become the heir apparent to the Call of Duty throne. Black Ops 2 has had a few problems since launch, mostly revolving around connection within multiplayer games, but despite that, the CoD community was full of good will. “I think in a few months this will be a GREAT game,” wrote one player on reddit. I’ve heard a lot of people saying that the game is the best one yet when the connections are good. The one pre-order bonus that every retailer online and off was able to offer was the “Nuketown 2025″ bonus map. An extremely popular map from Black Ops, remade for the new game’s setting. But rather than include it in the game as normal, Activision and Treyarch decided to offer it as a bonus, only for people who pre-ordered the game. One can assume they did it to boost initial sales, with people buying the game to make sure they got the map. Treyarch refused to say whether they would offer the map at a later time for a fee or in any other way. 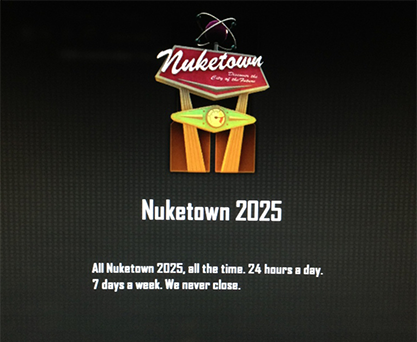 Nuketown 2025 / 24-7 will be back for special events. You can always play it with your friends in Custom Games. I’ve heard speculation that the reason for pulling the playlist is that 50 – 60% of the people playing multiplayer at any one time would be in that one playlist, which hurt matchmaking for other playlists. I don’t know if that’s really the reason, but I saw with my own eyes that those numbers are about right. When asked why they didn’t just add the map to the other standard playlists, Vonderhaar explained that he would, but he can’t because not everyone has the map, which fragments the players in each playlist, effectively doubling the number of playlists, meaning fewer players to get matched up against, meaning on the whole worse connections. @fazecbass Can’t do it or I would. It would fragment matchmaking really poorly at this stage. After the outburst from the community, they quickly reneged and offered a different playlist, called the “Chaos Moshpit”, which included Nuketown 2025 as well as some other more-hectic-than-average-but-less-hectic-than-Nuketown maps. The Chaos Moshpit playlist has Carrier, Cargo, Express, Hijacked, Slums, Standoff, and Nuketown 2025 in the rotation. 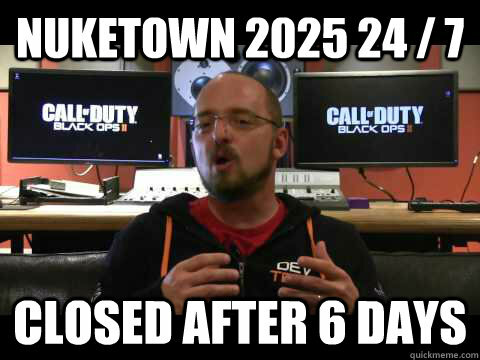 I personally don’t care too much how Treyarch chooses to use Nuketown. But clearly, the community does. The most upvoted Reddit thread in the Black Ops 2 subreddit is the complaint that the playlist had been removed. But Activision and Treyarch brought this upon themselves. The first mistake made was offering the map as a pre-order bonus. To segment the community from day one is a bad idea, knowing how popular the Nuketown map from Black Ops was. Given its popularity, I can’t imagine that the map will only be a pre-order bonus forever, but toying with its availability at all is simply manipulative. Activision and Treyarch knew the fanbase of that map (and that the map even had a fanbase, unlike most of the other maps in the series). Armed with that knowledge, they aimed to make its availability scarce, exploiting people’s psychology to get them to pre-order the game rather than waiting until later or never getting it at all. That on its own is bad, but given that most ardent CoD fans who loved Nuketown would have pre-ordered the game anyway, that point went without much criticism. But Activision and Treyarch took the thing that had enticed so many to pre-order the game and took away the ability to use it. Regardless of how skewed the playlist usage was, that is doing wrong by your customers. If you need to remedy the situation of player balance amongst the playlists, you don’t remove the offending playlist entirely, you replace it with other options that guide the players back to the other playlists (like they eventually did), or you give the map to everyone, and include the map in the regular playlists to start with. You killed the messenger, but I still fight for the users. RT to #bringbackNuketown2025 and we will add to a small maps moshpit. Vonderhaar tries to recruit his twitter followers to push a message to the higher-ups at Treyarch, while also showing us his proposed solution. It’s clear that within Treyarch, there had been a dispute, where the more reasonable people offered up a suggestion that wouldn’t anger players, still giving the players an option to use the map. But that side did not win, initially. The side that won was the side that decided to just remove the map from play completely. The decision to remove the map entirely may have been forgivable, had we not been able to see that there were people at Treyarch advocating for the player, like Vonderhaar, channeling his inner Tron. There are people within Treyarch who heard the argument not to remove the map and chose to do it anyway. Let that sink in. They ignored the people advocating for the players’ well-being. I bet they’re not too happy with David Vonderhaar right about now. Some people say “the customer is always right.” I don’t think that’s true. If the customer wants a faster horse and you just try to do that for them, you’re not going to get the automobile. But you can’t actively hurt your customer and expect them to forgive you without so much as an apology. In all your decisions, you must consider the feelings and needs of your customer. Of course, sometimes you know you’re right. The anger will pass. If you hold steady with conviction that your action was the right one, you may turn out to be right, as your customers come around to the idea. The map should not have been a pre-order bonus to begin with. But even once that had been done, they made a promise that they didn’t keep. The other big lesson is to empower your employees. Vonderhaar is right out there in the community. Not only did he lead the design of the game, he knows what the players want. Weekend warriors, competitive players, you name it. Yet he is powerless to make the decision to keep the playlist in the game. The overwrought structure of companies is a big problem in today’s world where people expect companies to act like a human. But that’s a topic for another day.